Our eye doctor, Dr. Bajwa is experienced and skilled in fitting adults and children with ortho-k lenses. Many patients, young and older, have benefited from the advantages of sharp vision after being fitted with orthokeratology in our office. Ortho-k offers an efficient way to slow, or possibly stop, the continued progression of nearsightedness in kids. In case you’re wondering why surgery isn’t a better option, keep in mind that laser procedures, such as LASIK, are not suitable for young children. As studies have demonstrated that orthokeratology is safe for all ages, it is currently regarded as the ideal option for myopia control in kids. Any nearsighted child with healthy eyes is a possible candidate for orthokeratology. Regular eye exams with visual acuity testing are a necessary part of proper kids’ eye care. 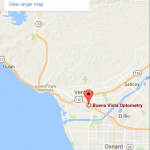 If your child has myopia and their vision prescription continually increases at each Ventura eye exam, ortho-k may be a good option. Our will evaluate your child’s vision and ocular condition to determine candidacy. Please contact us to schedule an appointment to discuss orthokeratology. Does anyone in your family suffer from Dry Eyes? Visit our Dry Eye Center, today.